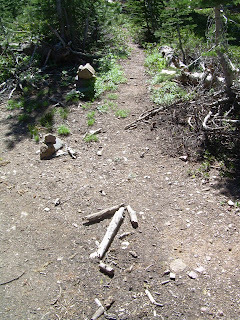 This was a delightful little section of trail to hike! Sunny, warm, open, and snow-free! 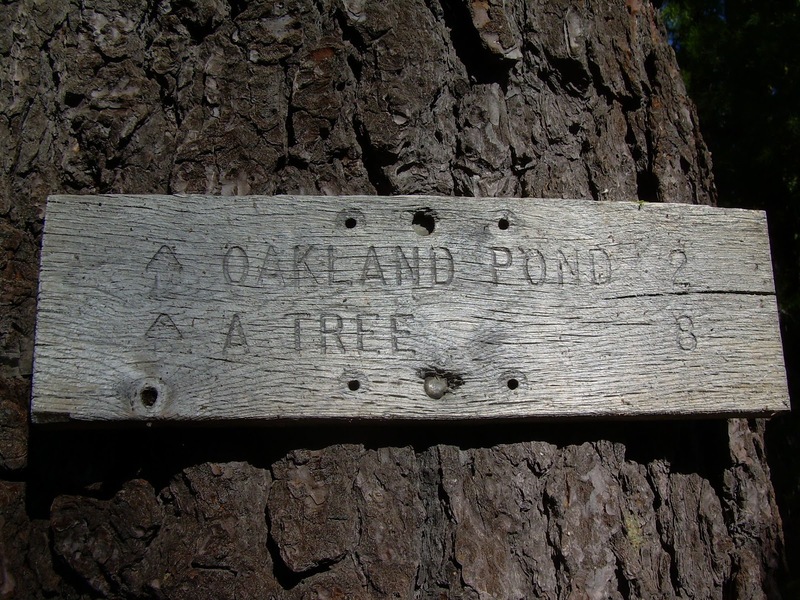 July 17: Amanda and I woke up early--I planned to hike 28.2 miles from Packer Lake Saddle to Quincy-Laporte Road, the next paved road on the trail. Amanda, at first, was a little disappointed about the distance to the next paved road thinking I'd have to spent the night out in the woods rather than with her, but I assured her, I could do 28.2 miles in a single day. I just needed an early start! I'd done more than that the day I left Walker Pass, and that was with a full pack. Now, a month later, I was stronger and tougher than ever, and I wouldn't need a full pack to boot. Yes, I could do that distance. It would officially be my second longest day so far of the trail. I was a little excited at the thought of doing big miles, day after day, now that the High Sierras were behind me. It was finally time to start doing big miles on a regular basis! So by 7:30 in the morning, Amanda was dropping me off at Packer Lake Saddle, and I started hiking northbound once again. 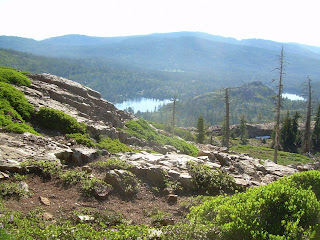 The trail followed along the tops of ridges, many of which had views to multiple lakes below. Occasionally, I'd still lose the trail in snow, but rarely for more than a few minutes at a time before I figured out where the trail emerged from the snow. views of many lakes below. I brought my iPod Shuffle with me and the time seemed to fly quickly. 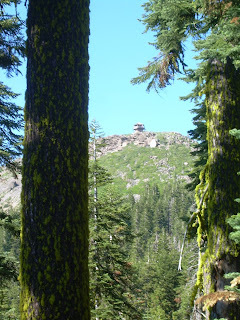 The day's hike was largely uneventful. I passed one hiker well off the trail who looked like he was breaking down camp still, and a couple of older hikers out for a day hike. Later in the afternoon, I caught up with GQ, which surprised me since I expected him to have gotten well ahead of me given my zero day. But he was moseying along slowly due to his upcoming visa expiration date--in eleven days, he'd be booted out of the country. He planned to use every last day he could and slowed his daily mileage considerably. Near the end of the hike, when I figured I had no more than a mile or so to go, I approached a southbound hiker who greeted me with, "Happy birthday!" I found this sign amusing. I bet I could find "a tree"
it was different from any other kind of tree. Indeed he had. We chatted a bit, and he asked about the need for an ice axe. He was planning to hike southbound all the way to Mount Whitney and heard horror stories about the snow pack. 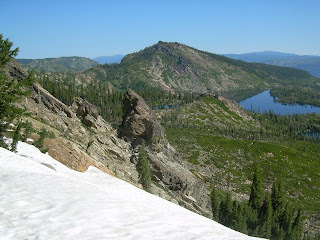 He already carried the heavy ice axe on his pack, but wondered if it was really necessary. I couldn't be certain of my answer. A lot of the snow I experienced would likely have melted by the time he reached those areas, but what if it was still a problem? I did tell him that the last time I pulled out my own ice axe was near Sonora Pass--between our location now and there, it definitely was not necessary. After that, it probably would not be necessary. deal with the occasional patch of snow. 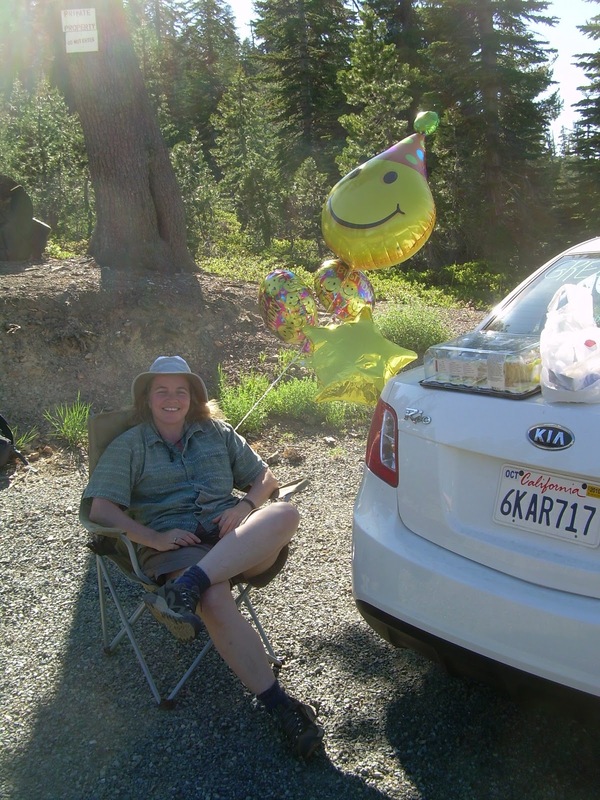 About ten minutes later, I reached Quincy-Laporte Road where I found Amanda sitting in a fold-up chair with the helium-filled balloons dangling off of it, talking with Bill, a hiker she lured off the trail with birthday cake and cold drinks. GQ arrived minutes later and stopped as well. Amanda also had a new form of trail magic she was providing: a hiker box. 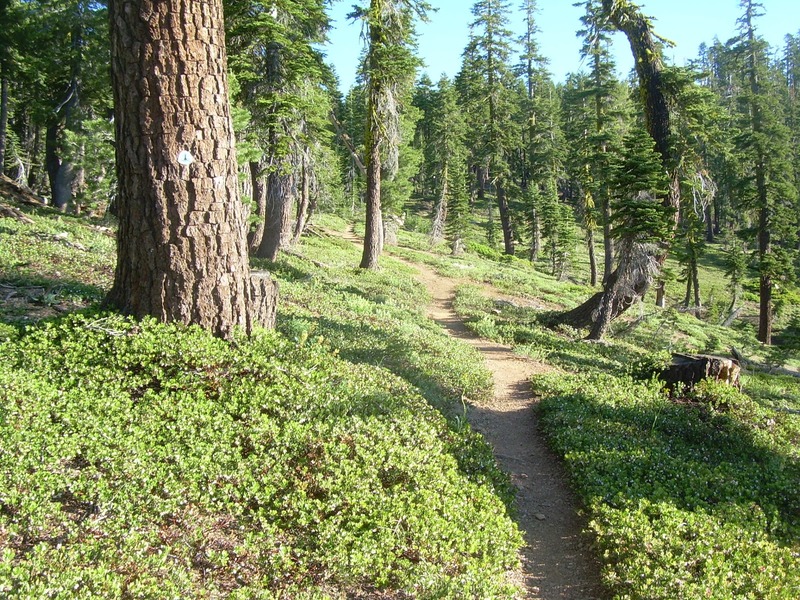 In many locations along the trail, usually in places such as hostels, post offices, and other hiker hangouts, there would be a hiker box left out. Hikers who had extra food or gear they didn't need could leave it in the hiker box, and following hikers could pick through the box and pick up whatever they needed. It's freecycling, in a box, for hikers. 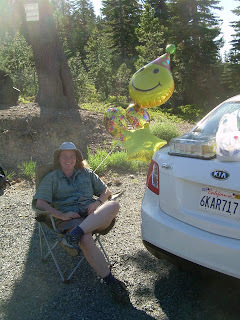 This, however, was the first time I'd ever seen a trail angel bring a hiker box to the trailhead! She filled it with a few books she had finished reading, extra ZipLocks, some snacks, and even postcards. I thought the postcards was a nice touch--it was the first time I'd ever seen a trail angel offering up postcards for hikers. I looked through the hiker box myself--I didn't realize Amanda had that up her sleeve and I wanted to see what was available myself! =) I picked out an Agatha Christie book for myself. GQ, Bill, Amanda, and I sat around for an hour or so, chatting, eating birthday cake, and drinking cold sodas. Eventually, though, GQ and Bill moved on, eager to find a place to camp for the night. Amanda and I filled up an ice chest with sodas and candy and--along with a large container of water--hid them behind some bushes. The stuff was left out of view of the road, but in clear view of the trail for hikers that would pass through later. Everything else went back into the car, and we drove back to Quincy for the night. on the trunk of the car! 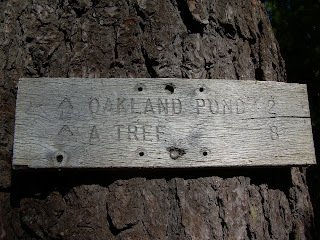 Thanks, Amanda, for the photo of "A Tree". The "A Tree" sign cracked me up! Halfway! Halfway! And One More Time... HALFWAY!